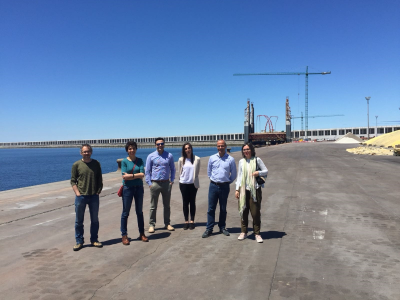 A team of technicians from the REDE group, from the CETMAR Foundation and from MeteoGalicia, met with the managers from different departments of the Port Authority of A Coruña to explain the work planned in the MarRISK project (INTERREG-POCTEP) in relation to the outer port of Punta Langosteira. The REDE Group exposed the advances in its task consisting in developing a tool for analysis of port resilience against climate change. CETMAR presented the methodology that will facilitate the dialogue to develop and channel the results related to the outer port towards the Authority and port operators. For its behalf, the representatives of MeteoGalicia, project coordinators, presented the first advances in the development of models of specific predictions on the impact of climate change in this area. In this task, MeteoGalicia collaborates closely with the Ephyslab group (University of Vigo). The meeting was also attended by a representative of the GEAMA Group, of the University of A Coruña, who regularly assists the Port Authority and also plans to collaborate with the groups in MarRISK. After the meeting, the technicians moved to visit the facilities, guided by the representative of the University of A Coruña.